Only 93 million miles from Earth, a certain G-type star is beginning to act up. Every 11 years or so, the solar cycle brings a period of high solar activity. Giant islands of magnetism–”sunspots”–break through the stellar surface in increasing numbers. Sometimes they erupt like a billion atomic bombs going off at once, producing intense flares of X-rays and UV radiation, and hurling massive clouds of plasma toward Earth. This is happening right now. Only a few years ago the Sun was in a state of deep quiet, but as 2012 unfolds, the pendulum is swinging. 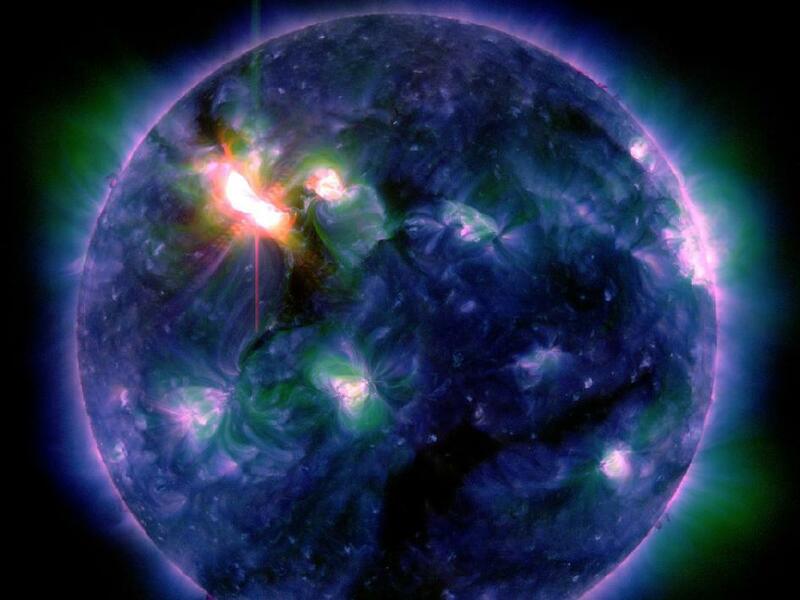 Strong flares are becoming commonplace as sunspots once again pepper the solar disk. Fortunately, Earth is defended from solar storms by a strong, global magnetic field. In March 2012, those defenses were tested. At the very beginning of the month, a remarkable sunspot appeared on the Sun’s eastern limb. AR1429, as experts called it, was an angry-looking region almost as wide as the planet Jupiter. Almost as soon as it appeared, it began to erupt. During the period March 2nd to 15th, it rotated across the solar disk and fired off more than 50 flares. Three of those eruptions were X-class flares, the most powerful kind. As the eruptions continued almost non-stop, Earth’s magnetic field was buffeted by coronal mass ejections or “CMEs.” One of those clouds hit Earth’s magnetosphere so hard, our planet’s magnetic field was sharply compressed, leaving geosynchronous satellites on the outside looking in. For a while, the spacecraft were directly exposed to solar wind plasma. Charged particles propelled by the blasts swirled around Earth, producing the strongest radiation storm in almost 10 years. When those particles rained down on the upper atmosphere, they dumped enough energy in three days alone (March 7-10) to power every residence in New York City for two years. Bright auroras circled both poles, and Northern Lights spilled across the Canadian border into the lower 48 states. Luminous sheets of red and green were sighted as far south as Nebraska. When all was said and done, the defenses held–no harm done. It makes you wonder, what if? What if Earth didn’t have a magnetic field to fend off CMEs and deflect the most energetic particles from the Sun. The answer might lie on Mars. The red planet has no global magnetic field and as a result its atmosphere has been stripped away over time by CMEs and other gusts of solar wind. At least that’s what many researchers believe. Today, Mars is a desiccated and apparently lifeless wasteland. Only 93 million miles from Earth, a G-type star is acting up. Thank goodness for magnetism. With your inner and outer children, read, watch, and listen in to “Super Star Meets the Plucky Planet,” a rhyming and animated conversation between the Sun and Earth, at http://spaceplace.nasa.gov/story-superstar.